Three weeks to go! Or one. Or five. There’s no way of knowing exactly when baby girl is going to arrive but suffice to say we’ve entered the drop zone. This pregnancy has been different from our first in lots of ways; lighter and less worrying without the knowledge of a serious heart condition and surgery, but heavier and hotter and harder physically. There’s the old wives tale that girls make you feel more sick and rob you of your beauty, but while there may be mileage in that, I’m fairly sure it’s largely attributable to running round after a toddler, combined with a different time of year. Nino was born on a cold day at the beginning of February whereas this little lady and I have bunked together through a scorching holiday in Italy and the hottest weather we’ve seen in England for decades. Heatwaves and baking do not go hand in hand. Butter left out for softening starts to sweat within minutes, egg whites lose their stability and the sheer heat of the oven is enough to send anyone running for the freezer, let alone those with an extra few kilos strapped to their stomach. But the other day my mum gifted me an enormous bunch of blackened bananas (another product of this insane heat) and there were only so many I could freeze for smoothies and banana nice cream. 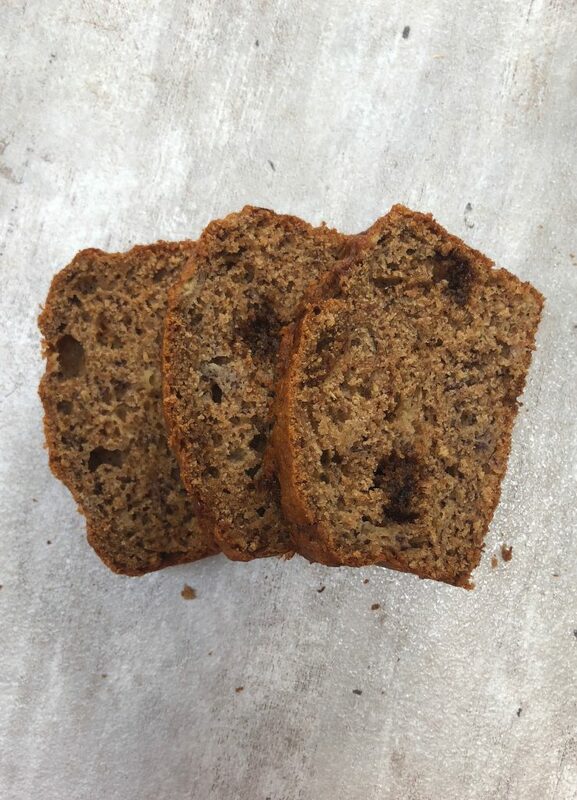 Banana bread it had to be. I baked this batch up as two little loaves so we would have one to freeze for visitors when the baby arrives. Obviously it’s already been eaten, but the option is there if you’re that way inclined. 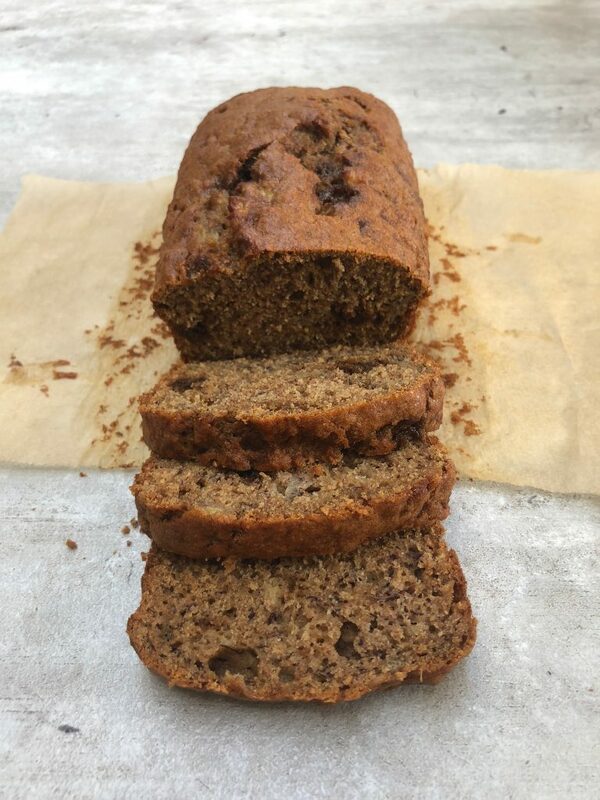 The star of the show here is the bananas – I wanted to make a family friendly, not too sweet loaf with very little in the way of refined sugar: three tablespoons in total, across two loaves, plus any natural occurring sugars from the banana. 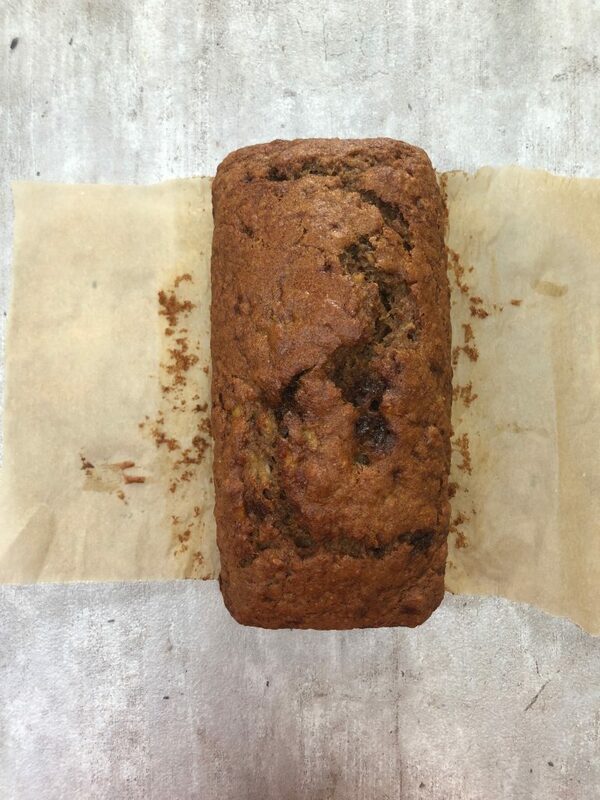 Olive oil for the fat, plus a lower sugar content, make it lighter than your average banana bread, and incredibly moreish. This is an everyday loaf that could easily be elevated to pudding status with the addition of some raisins, chopped dates or chocolate chips. Well worth turning that oven on for, I promise. 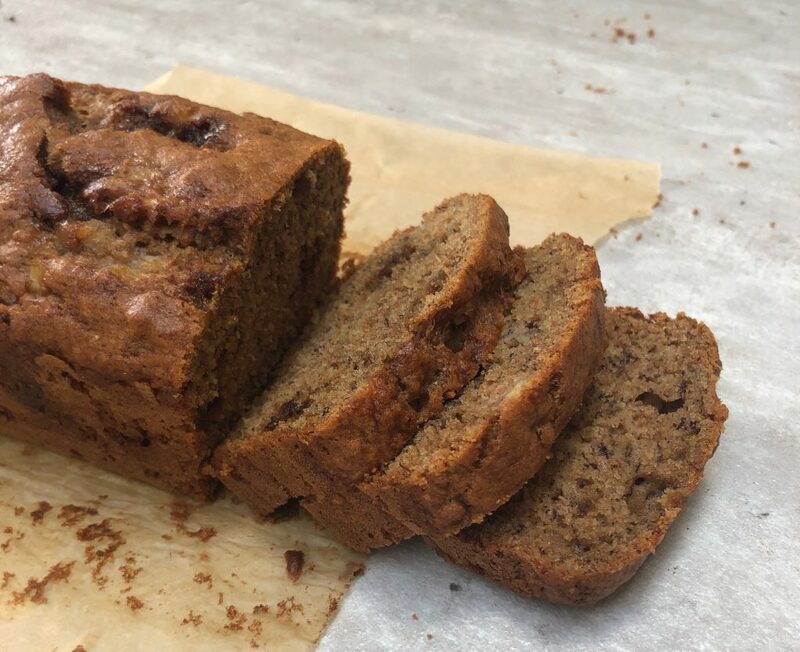 These beautifully light, moist loaves are sweetened primarily with ripe bananas, with just 1½ tablespoons of sugar per loaf. 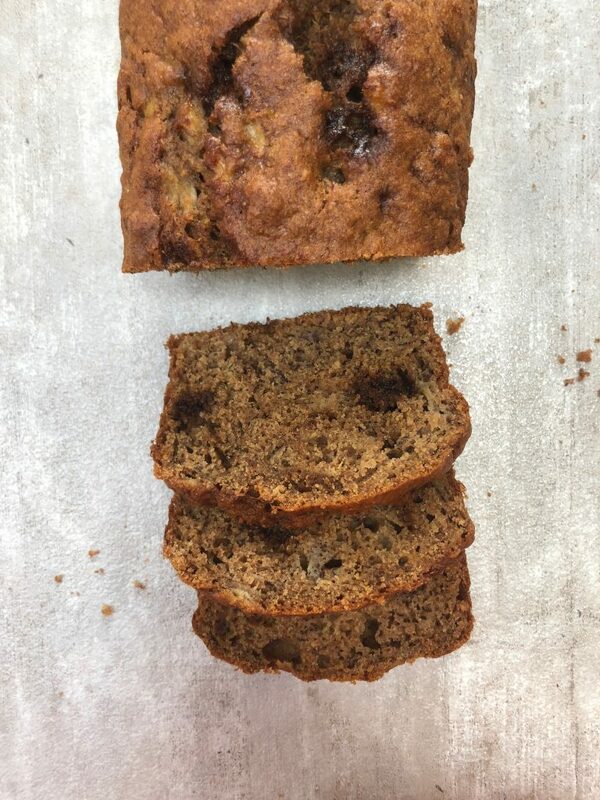 Here I've left them plain, but feel free to add chopped dates, raisins or chocolate chunks for an extra hint of sweetness and texture. I like mine sliced thickly and served with a smear of peanut butter for tea time or with a dollop of yoghurt and berries for pudding. Preheat the oven to 160 C/140 C fan. Grease and line two 1lb/450g loaf tins with baking parchment. In a medium bowl, sift together the flour, baking powder, bicarbonate of soda, cinnamon and salt. In a separate bowl, stir together the mashed bananas, eggs, olive oil, sugar and milk. Fold the wet ingredients into the dry, then divide between your two loaf tins and bake for 30 minutes, or until the top is set and golden and a skewer inserted in the middle comes out clean. Allow to cool completely in their tins then remove and store in an airtight container. Will keep for several days and also freezes beautifully. it would be nice if you converted the metric measurements for people in the U.S.